Datalogic Gryphon I GM4100-HC - SCANNER ONLY, 910 MHz, Health care Housing, Display. Cables and accessories must be purchased separately. The Datalogic Gryphon I GM4100-HC cordless linear imaging readers with disinfectant-ready housings offer the richest feature set among general purpose health care product offerings. Extremely versatile and durable, the Gryphon I GM4100-HC cordless linear imaging readers are the ultimate solution for applications in retail and light industrial environments where mobility is necessary for improved productivity. Mobile communications also eliminate the restraints caused by cabled devices, providing a safer and more efficient environment for employees. The Gryphon I GM4100-HC reader series offer scalable solutions from simple point-to-point applications to networking capabilities combined with seamless roaming for complex installations. An optional display with a 3-button keypad provides battery status, radio coverage indicator and enables operator interaction with the host system. 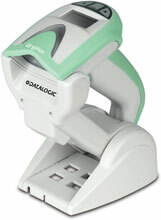 The Datalogic GM4100-HC-D910 is also known as Data Logic	DTL-GM4100HCD910	or GM4100HCD910	.